Number one issues have become something of a complicated topic over the past few years. Where once they were a cause for excitement and fanfare, they now reek of marketing schemes and the very mindset that nearly irreparably broke the business in the '90s. Worse yet, it seems almost every major publisher has launched one initiative or another to be sure the comics shelves are thoroughly coated in big flashy #1 logos. Crafting a well-done number one issue, much like a television pilot, is a fine art, and although there are hordes of number one issues on the shelf, very few have managed to kickstart an exciting narrative. Cullen Bunn's Magento emerges from the first issue world of exposition and introductions with a strong voice and intense story that demands the attention of readers. The story's opening two pages masterfully establish the tone of things to come. A barista recounts the events that transpired in his coffee shop that morning, in which a man had his metal dental fillings removed and replaced in a manner that's sure to get your attention. The visual gag was an intense surprise that I'll leave for you to uncover yourself, but it certainly hammers home that this isn't your upbeat electric guitar–themed X-Men story. Following this scene we move to a dingy hotel room where the Master of Magnetism invites us, in classic noir style, into his head via black and white narration bubbles. This little artistic decision is a perfect example of the book's attention to detail and the quality you can expect from the pages to come. Magneto takes us through the morning's events in a series of blue-hued flashback panels and then fills us in on his new quest to dismantle the various threats that may loom over the mutant race. Magneto then takes us to his next hit, which comes with a twist; the murderer, who has killed several mutants, turned himself in. 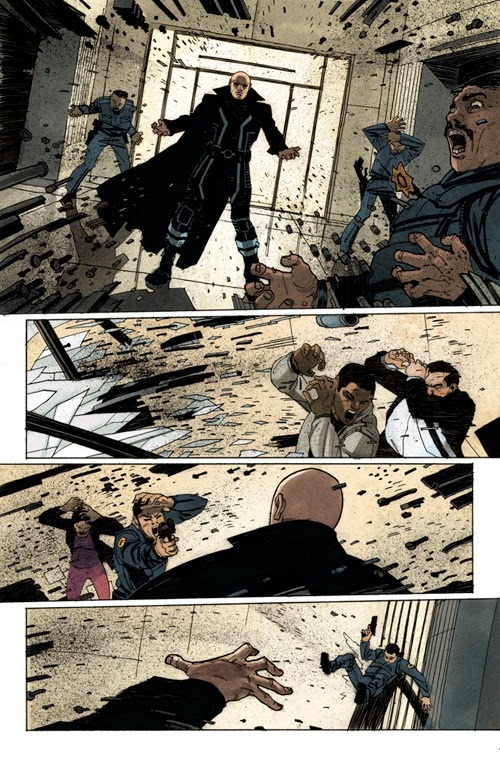 Magneto refuses to let this stop his quest and enters the precinct where the murderer is being held. He quickly forms himself his trademark helmet while repelling the defensive maneuvers of the police inside. Bunn introduces a nice visual of blue boxes illuminating all the varying metal details around the room. Its fun to see a book that has a visual directive that matches the strength of the story. This scene also reminds you that while Magneto may not be as powerful as he used to be, he's no less dangerous. He ultimately makes his way to the prisoner but is ambushed by the killer's half sentinel side, which he manages to take down, ending the issue. 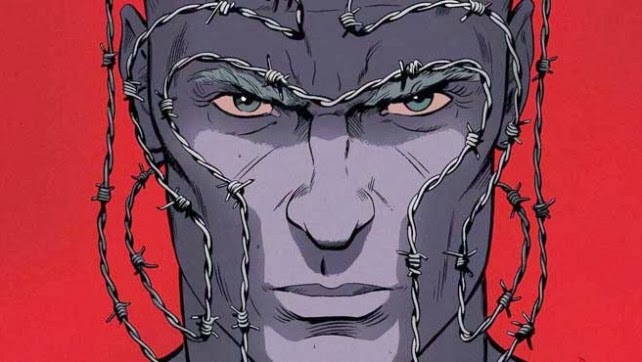 Magneto #1 was a fast read courtesy of tight, visual storytelling and a nicely paced plot. Although it didn't quite set up a massive narrative, it did establish the atmosphere of a procedural show with a clear voice and direction. The opening gag reminded me of something Tarantino would have done in his Reservoir Dogs days, while the overarching idea reminds me of some of the best X-Force. Decreasing the power of a major hero is a tired gag that's often done cheaply and in a clear attempt to drum up some suspense. While Magneto depicts an Erik who's technically weaker from the events of AVX, the strong story proves he's still a force to be reckoned with and uses the power change as a vehicle for character development. Ultimately, Bunn uses his pages to mold a #1 that is genuinely worth celebrating. What did you think of Magneto? Let us know what you thought below and check back to fanboysanonymous.com for more All New Marvel Now reviews.